I just find Ariel’s story so incredibly uplifting and hopeful. What girl – or woman, for that matter – can’t relate to a girl who wants to run off and explore the world? I love Ariel’s sense of adventure and wonder, her amazement at the tiniest of human details. Her love story is heart-breakingly sad, but beautiful – I always a love a happy ending! Some of the songs in The Little Mermaid were so fantastic, I think they hold up to the songs in today’s movies! And while Ursula is a villain and we all dislike villains, you must admit she’s a pretty awesome bad guy, right? Walt Disney just released The Little Mermaid Blu-ray Diamond Edition and it’s full of bonus features that will rock your socks off! You can purchase Walt Disney’s The Little Mermaid Blu-ray Diamond Edition on Amazon.com, or any retail store that carries Disney movies! On sale on Amazon.com for just $36.99 right now! On sale for just $26.99 on Amazon.com right now! 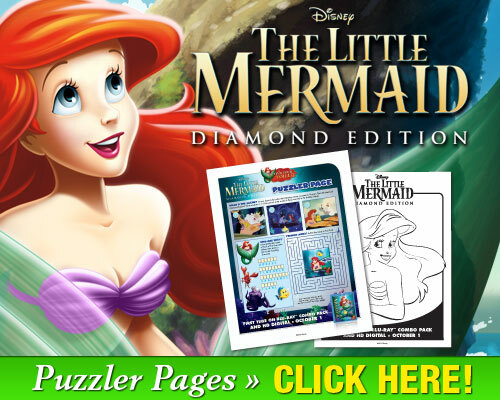 If you’re looking for a fun way to make a whole afternoon out of watching Walt Disney’s The Little Mermaid Diamond Edition Blu-ray Combo Pack, here are some super fun printables for your little ones! Get Social with Walt Disney’s The Little Mermaid! 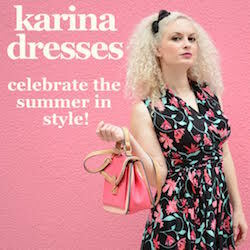 Of course you know I am also hosting a giveaway! Yay! One lucky reader will win their very own copy of Walt Disney’s The Little Mermaid Diamond Edition Blu-ray Combo Pack! I have always loved The Little Mermaid movie and it is now my daughter’s favorite. Flounder and Sebastian are great! I love this movie because the songs are so much fun! Because I grew up watching this! A great story from Hans Christian Anderson (re-written by Disney) with brilliant music by Howard Ashman and Alan Menken at their best. I like the movie because Arial sings songs with all her fishy friends. I like The Little Mermaid because of all the songs and also because of Sebastian. I love the songs! so much fun watching with my baby girl. I love how the little mermaid sings. Love the songs. I loved the movie when I was little so I want to pass it along to my twins! I like the music in the movie. My sister, Christina loved the movie, The Little Mermaid. This has been my favorite movie since I was a little girl! I adore the songs! I like the basis of the story, that the little mermaid will use her courage and determination to make her dreams come true—and save her father’s beloved kingdom from the sneaky sea witch Ursula. I love the songs and the romance! Tell me why you love The Little Mermaid! I love it because I remember singing along with all the songs when I was little! I grew up watching this. I’m totally nostalgic! I love the music from the movie! I like the Music and how confident Ariel is! I love the little mermaid becaue of the music in it and now my daughter is a huge fan. I love the little mermaid because I grew up watching this movie and singing all of the songs by heart! I want my kids to do the same. I love the music and the story! It’s such a classic! I love singing the songs! its a great story with awesome characters and wonderful songs! All the characters are well developed. Ariel is a red head! I love the movie music. I love the music & story! love the whole love story where she is willing to give up something for the guy she wants! Before I grew up, I loved the idea of living in the seas! I love the Little Mermaid because it makes me and my kids laugh and we love to sing along with it. I think this movie has the best songs and humor of any of the newer Disney movies. I love it because it is so romantic. Because of all the wonderful characters and songs. We love the great songs. It’s a family classic, watched the VHS version when my kids were little! Ariel had a dream and she made it come true. I love the Little Mermaid because it is a classic from my generation!! I love the music (especially the happy Under the Sea) and the mermaids/sealife theme. I love Ariels spirit. The songs are amazing. I also really miss the old animated movies. This will make an awesome gift! I just love the story so much. Its funny, fantasy, fantastic, and all Disney animations like this one i grew up watching. bc it reminds me of my childhood! I love Ariel’s red hair; it reminds me of my sister’s hair who passed away some years ago. I wouldn’t say I love it. I just enjoy watching these types of movies with my children. I’ve loved all things Hans Christian Andersen since I was a child myself, and the Little Mermaid has always been one of my favorite children’s stories. I love the Disney version (although I do wish they hadn’t changed the ending of the story – it was so sad yet beautiful). I have loved this since I was a little girl! I remember going to see it for my 11th birthday, fell in love with it right away. Two of my daughters are redheads so Ariel was always a favorite in our family. This is such a great family movie! I love it for the music and the fun characters! The little mermaid is great because of the dichotomy of good & evil & how she triumphs. The music, it is so much fun. Just a classic! Who growing up in the 90’s didn’t see this movie! It was my sisters favorite movie so we watched it all the time. I love the music from the Little Mermaid, especially “Under the Sea”! I love the usual setting (under the sea) and the amazing soundtrack. I love the characters, the animation, and the soundtrack. Not to mention, the story is so touching and heartwarming. It was the first movie I ever saw in a theater. Because it reminds me of my childhood. I love the songs and sweet story! It’s a fun movie with great songs and wonder-full characters! I love the music and love that Arial is a red head like my daughter! I love the Little Mermaid for the wonderful songs. One of the best Disney movies. Because it’s my daughters favorite. love her because she is so adventurous and curious and i love her red hair. I always loved the music! I love the music and Sebastian. I love that my daughter loves Ariel! I like the Little Mermaid because she followed her dream. I love The Little Mermaid because of the great music and characters. It’s a great story with great music! I love the songs. I used to sing Part of Your World to my kids to get them to sleep. They still request it sometimes. I would love to be able to show them the movie. I like the movie because it made my daughter happy. the music ! we love to sing a long ! I love the Little Mermaid because she was a young woman unfraid to be different and pursue her dreams. My lil girls are just starting to get to know the Princess’s, I would love to win this adventurous movie for them!! I like the little mermaid because she reminds me of how innocent and naive I use to be! She is lovely redhead like me! I like the Little Mermaid because it has wonderful music. It’s always been an adorable movie to watch with the whole family. The Little Mermaid came out when I was about 7, and I have loved it ever since. I love Disney movies in general but Little Mermaid is so great and has such great songs! I love the music from this movie. When I was in high school, I just KNEW I was going to name my daughter Ariel and my son Sebastian. Haha! Didn’t quite work out that way but I still LOOOVE the movie. We sing the songs here a LOT! I always loved The Little Mermaid because she has red hair just like me! My girls love it because of all the fun songs. it was my first real disney movie. and i have red hair like ariel. plus mermaids! I absolutely love Ariel’s singing. We have never seen The Little Mermaid but I think that my children would love it. And I would love to watch it with them. I love the music and the story. the songs and love story! I love the Little Mermaid because it is a good family movie, the music and songs are outstanding. I have loved the little mermaid since I was a child. I used to watch it over and over and over…and I would love to own this so I can relive my childhood and do that again! Any Disney is perfection, but I love the side characters like Sebastian and Flounder! I like the songs ! I like it because the music is good. The music is great and I remember it from my teen years. I grew up watching this and the music is great! I love the music and this was the first movie I brought my son to watch in the theater. Fond memories. The music is fantastic,and this movie has nostalgic meaning for me and my now 25 yo (gasp!) daughter. I like the songs and its really cute. I love the Little Mermaid because it’s such a great classic Disney movie that I now enjoy with my own girls! Because the songs are so fun and amazing. Who doesn’t love thismovie?? It was my first Disney movie! It’s a cute movie and the songs are good. it was one of my favorites as a child and now i can share it with my daughter. I love The Little Mermaid because it’s a great, classic animated film. It’s fun for the whole family & has an array of entertaining characters. My girls grew up on this movie. We especially love Sebastian. I love this movie because of the music. This movie makes the little one smile! i love ariel, she is beautiful and she sings beautiful! We love Flounder because he’s so funny on the movie. I love it because it is cute and funny and I love mermaids. I love it because of all the great characters and songs. I really like Sebastian. I love that she never gave up on her dream. U*nder the sea is one of the most memorable songs. I love The Little Mermaid because it is a great family movie with great songs. I love that it brings me back to my childhood. My grandkids love all the music in the movie.